This article answers some Frequently Asked Questions about the Shivering Isles expansion. Only questions about general gameplay are answered here. If you have a question about a particular quest, check that quest's walkthrough (see the Quests article or the Quests category to find the walkthrough). Similarly, if you have a question about a particular ruin or location, see that location's walkthrough (at the Places article or Places category). 1.1 Can I get a house or safe storage in the Shivering Isles? 1.2 How do I stop the endless Knights of Order at an obelisk? 1.3 Should I choose Mania or Dementia? What difference does it make? 1.4 Why did all of the map markers disappear? 2.1 How can I obtain Shivering Isles? 2.2 I just installed the expansion. How do I get to the Shivering Isles? 2.3 Can I use my existing Oblivion character? 2.4 Will I be able to return to Tamriel after starting Shivering Isles? 2.5 Does Shivering Isles change anything in regular Oblivion? 2.6 Is there a difference between the retail disc-based expansion and the downloaded version? 3.1 What new weapons and equipment are available in Shivering Isles? 3.2 What are the really good new weapons to look for? 3.3 I've found an odd item. What is it? 4.1 What patches do I need to install to play Shivering Isles? 4.2 Why can't I duplicate items any more? 4.3 What should I do about the Reference Bug? Can I get a house or safe storage in the Shivering Isles? You will acquire a bed and containers that you own once you have completed either Ritual of Mania or Ritual of Dementia. The corresponding ducal quarters then become yours, and you can safely store items in any of the containers within the ducal quarters, except for one respawning food cupboard. There are some other containers in the Shivering Isles that do not respawn and can be safely used for storage. Other examples include the jewelry box and dresser in Hirrus Clutumnus' house that becomes available at the end of the Final Resting quest. However, leaving items in other random containers throughout the Shivering Isles will, in general, cause the items to disappear when the container resets (see Containers for details). Another option is to return to Tamriel and use any house(s) that you own in Tamriel. At all points during the Shivering Isles quests it is always possible (although at times somewhat awkward) to return to Tamriel (see also Will I be able to return to Tamriel after starting Shivering Isles?). How do I stop the endless Knights of Order at an obelisk? 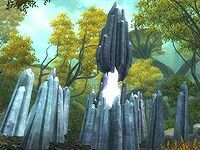 As you travel through the Shivering Isles, you will encounter silvery obelisks. At some stages of the Main Quest these obelisks will be activated and defended by a Priest of Order and multiple Knights of Order. Initially there will be just 3 knights, but more will constantly appear until the obelisk is deactivated. Kill the Priest of Order. While the Priest is unconscious, place three Hearts of Order inside the obelisk. Alternatively, kill him very quickly after placing the last heart. See Obelisks for more details. Should I choose Mania or Dementia? What difference does it make? At each point in the main quest where you choose a side (passing through the Gates of Madness; how to treat the adventurers in Baiting the Trap; who to help and which flame to light in The Cold Flame of Agnon; Ritual of Accession) you can freely choose whether to take the Manic or Demented option. Each choice is independent of the others. If you want, you can choose Mania for one quest, then choose Dementia for the following quest. Lighting the Flame of Agnon determines whether you receive the Raiment of Arden-Sul or the Raiment of Intrigue. It also determines which blessing is available, Flame of Mania or Flame of Dementia (see The Cold Flame of Agnon). The Ritual of Accession is the one decision that has more long-lasting implications. These implications are summarized on the quest page. Why did all of the map markers disappear? Once the quest Retaking The Fringe has been started, all of the map markers in the Fringe will disappear. You will need to explore the Fringe again in order for the markers to reappear. Until the main questline is completed, the Fringe will remain essentially disconnected from the rest of the Shivering Isles. Only map markers for the region you are in will appear on your map and be available for fast travel (i.e., when you are in the Fringe, you will only see markers within the Fringe). Note that you can still go back to Tamriel at any point. You will need to first travel to the Gates of Madness (using fast travel if you prefer), then walk through the gates to enter the Fringe. From there you can travel to the Door to Cyrodiil (using fast travel if you have already re-explored the area). How can I obtain Shivering Isles? Shivering Isles has been released in several formats. The expansion's content is the same in each of these different formats, although some formats do not automatically include the latest patch, installation of which is necessary to fix Oblivion's Reference Bug. The GOTY (Game of the Year) edition of Oblivion includes Shivering Isles and Knights of the Nine. This is a complete release of the game and does not require that Oblivion already be installed. All GOTY editions include the latest patch. The GOTY edition has been released for PC, Xbox 360, and PS3. A retail disc containing Shivering Isles as an expansion is available for PC, Xbox 360, and PS3. Oblivion must already be installed on the computer/console for this retail disc to work. The PC retail disc was released in March 2007. This disc does not include the latest patch; PC users should be sure to download and install the most recent patch. The Xbox 360 retail disc was released in October 2007. It includes the latest patch and also includes Knights of the Nine. The Playstation 3 retail disc was released in November 2007. The expansion can be downloaded from Xbox Live Marketplace on Xbox 360 or the Playstation Store on Playstation 3. The Xbox 360 download does not include the patch, although any console that is connected to Xbox Live should automatically download all current patches (the patch article includes details on how to confirm whether or not an Xbox 360 has been patched). It is not possible to download Shivering Isles for the PC, unless you are playing Oblivion using Direct2Drive or Steam. The 5th Anniversary Edition includes Shivering Isles and Knights of the Nine and was released on July 12, 2011 for PC, Xbox 360, and PS3. I just installed the expansion. How do I get to the Shivering Isles? After 24 hours have passed in the game, you will automatically get a quest update and a map marker. If you're impatient, you can choose to use the wait function to get 24 hours. Or you can go straight to the location in Niben Bay, east of Bravil where "A Strange Door" has appeared, without waiting for the quest update. See A Door in Niben Bay for full details. After entering the Strange Door, there are still a few quests that must be completed before all of Shivering Isles becomes available to your character. In particular, you need to kill the Gatekeeper, as part of the quest Through the Fringe of Madness. Can I use my existing Oblivion character? Yes. You can start playing Shivering Isles using any character at any level. You can use your level 45 super-buffed invincible character or you can start a completely new character. You don't have to complete any standard Oblivion quests before doing Shivering Isles, and you can play Shivering Isles even if you have many half-completed quests in regular Oblivion. All of your existing saves will be compatible with Shivering Isles, regardless of which version of SI has been installed. Will I be able to return to Tamriel after starting Shivering Isles? Yes. You can travel back to the Door to Cyrodiil at any time and return to Tamriel. It can be somewhat inconvenient, however. In particular, once you have progressed part way through the Shivering Isles Main Quest, you will need to make multiple fast travel hops in order to get back to Tamriel. See also: Why did all of the map markers disappear? Does Shivering Isles change anything in regular Oblivion? The dialogues for Sheogorath's Daedric quest are updated, depending upon where you are in the Shivering Isles Main Quest. The daedric quest can still be completed (and Wabbajack obtained). Is there a difference between the retail disc-based expansion and the downloaded version? For the downloaded expansion, no such verification is necessary since you will continue to launch the game using the original disc. What new weapons and equipment are available in Shivering Isles? There are many new items added by Shivering Isles, which are listed at Items and related articles. In particular, there are articles listing all of the available Weapons, Armor, Clothing, Unique Clothing and Jewelry, and Ingredients. The category Shivering Isles Items can also be used to browse through all of the new items. Most of the random loot available in regular Oblivion will also show up in the Shivering Isles. So Generic Magic Weapons and Generic Magic Apparel will appear in containers and on enemy NPCs. What are the really good new weapons to look for? I've found an odd item. What is it? Most of the odd items are part of the quest The Museum of Oddities. Several of these oddities have a small (1-2%) chance of showing up in any container in the Isles. There are five unique skulls in various locations. These are part of the non-journal quest Ghosts of the Hill of Suicides. Shambles skulls, on the other hand, are just nearly worthless clutter. If you're still not sure what you're supposed to do with an item, use the "Go" feature to find out what it is: type its name (exactly as it appears in your inventory) into the Search box on the left side of this page, and hit the "Go" button. What patches do I need to install to play Shivering Isles? The version 1.2.0416 patch (also known as "version 1.2.1", released on April 30, 2007) should be installed. PC users will need to manually download and install the patch. Xbox 360 users should automatically have the patch installed if they are connected to Xbox Live. This patch fixes the Reference Bug, in addition to incorporating all updates provided by earlier patches. The earlier version 1.2.0214 patch (commonly known as simply "version 1.2", released March 23, 2007) is required for Shivering Isles to work. Therefore, many exploits that are available in unpatched versions of the game can no longer be used with Shivering Isles. Why can't I duplicate items any more? The patches necessary for Shivering Isles to work (in particular the version 1.2 patch) fixed the arrow duplication glitch. However, an alternative duplication glitch, using scrolls, will still work even after Shivering Isles has been installed. What should I do about the Reference Bug? Install the latest patch (you should do this even if you're not playing or even installing Shivering Isles). See Reference Bug for more information. This page was last modified on 19 October 2015, at 23:45.